The way marking along the Dales Way is now generally very good. 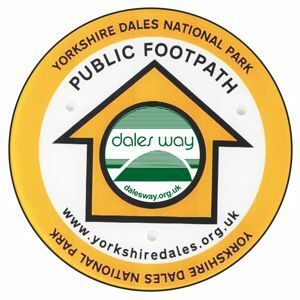 Since 2017 new waymarks have begun to appear which carry the Dales Way logo on an inner clear window at the centre of the waymark. There are still many of the older, traditional Dales Way waymarks out there though. Some examples of the special way marks obtained by the Dales Way Association are shown below. The route may also be indicated by finger posts or other signs.